Snowed Inn Cabin - Luxury in Gated White Mountain C.C. Upon arrival to the 'Snowed Inn' Cabin, you will immediately fall in love with this 3400 square foot gem in White Mountain Summer Homes. This 'all suite' home features private baths in all bedrooms! Dense Ponderosa Pines surround the property. Highly upgraded with magnificent wooded views and perfect privacy. Great room floor plan, fireplace, wood floors, surround sound, spacious kitchen, huge island with bar stools and more seating for 8 under an antler chandelier. Beautiful Master Suite with sitting area & gas fireplace. Relax on the porch and enjoy the hummingbirds, squirrels and birds as they scurry about their day, or just take a nap and enjoy the cool fresh mountain air. Take a walk through the forest, ride bikes, golf or ski and enjoy the quiet solitude that surrounds this perfect spot. Master has 1 king bed, #2 Bedroom has 2 Queens, #3 Bedroom has 1 Queen, #4 Bedroom has 1 Queen. Cozy, Comfortable, Spacious and Unforgettable! You will not be disappointed! Closest development to ski resort and casino. Short drive to local restaurants, groceries, theaters and outdoor activities. 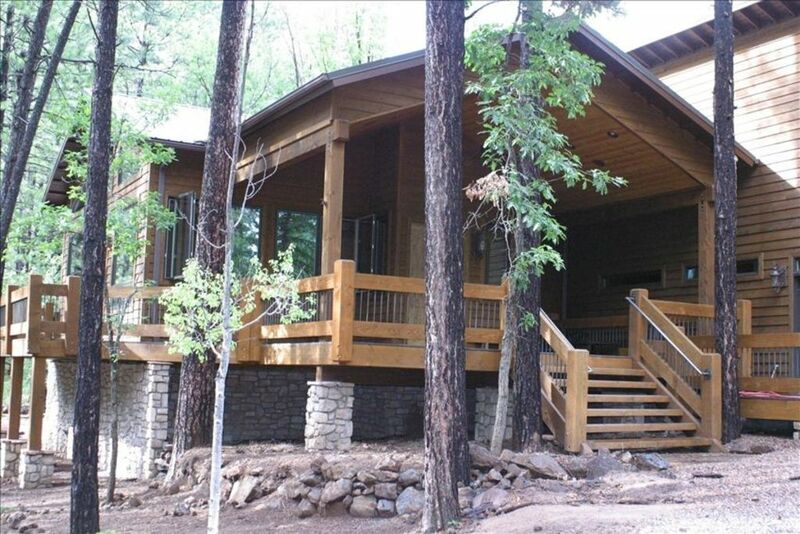 Our cabin has multiple outdoor decks and all four bedrooms include its own private bath. Separate powder room for visitors. Dense Ponderosa Pine and Oak trees surround the home. All baths include hair dryers and towels. Great location and very nice home! Loved the house. it was so open and clean. very accommodating for our family. Thank you again for allowing us to stay in your home. We had a great time. Did t realize we stayed there 5 years ago until we wrote again in the book. The cabin is beautiful and there is a lot of room for family and friends! It was our first white Christmas and we enjoyed it very much. The house is fantastic, especially with the en-suite bathroom in each of the bedrooms. The kitchen is well supplied with a variety of cooking implements and space to work in. The family had a great time. The only drawback we found is there are not enough large dinner plates for the house's stated capacity...pretty small potatoes, considering the range and quality of amenities overall. Super happy you had a great Thanksgiving! Appreciate you taking the time for a review and I will make sure to have additional dinner plates for guests in the future. Happy 2019! Perfect! So much more than I expected or imagined. We had a wonderful stay in this beautiful home. This home is very clean and well equipped. The owners really take pride in this home. It was so nice that all of us had our own bathrooms and a powder room. We love the location, in the winter is great for snow events, even though we not have any while there and the summer you can do fishing, hiking and biking and just enjoy the beautiful surroundings. The owner was very responsive to the one minor situation we encounter. We definitely want to come back to this home. Non-refundable cleaning fee $175.00 Refundable damage deposit $400. 7nights or more 10% discount/30 nights or more 20% discount. 3 Day Holidays such as MLK, President's Day, Easter Weekend, Memorial Weekend, July 4th, Labor Day and Veteran's Day rates are $425.00 per night. Until confirmed, rates are subject to change without notice. Exceeding guest limits will forfeit refundable deposit and/or will be billed accordingly as stated in the rental agreement.